Artist Joe Hogan and Mike Vasquez's crossover series are the best example that Adventure Time and its style is just perfect for mash-ups. 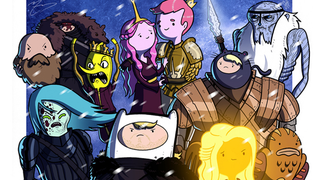 Their latest piece has really serious and funny-looking Game of Thrones characters. Their prints will be available at this year's Comic Con or, alternatively, you can grab them on Etsy. Here's the full piece. It's easy to recognize everyone.